Samsung released the Samsung Galaxy S9 and S9+ at the MWC 2018 event in Barcelona. Samsung improved the camera a lot with this new camera, it comes with a variable aperture feature which lets the user change the aperture from f/1.5 to f/2.4. Samsung also added a lot of new features to the camera including support for super slo-mo video recording which captures slow-motion videos at 960 frames per second. Let’s see how you can capture the super slo-mo videos on Samsung Galaxy S9 and Galaxy S9+. Swipe up from the home screen to open the app drawer, and launch the camera app. Swipe on the camera to switch to the Super slo-mo mode. Once in the slo-mo mode, align the frame (yellow box) to the place where the motion has to be detected by the camera. Now start the recording by taping the record button and start the event (whatever you want to capture a slow-motion view of). Also, make sure that the event you want to record should pass through the yellow box on the camera’s viewfinder. Once the event passes through the yellow box, you will see a flash on the screen which means the camera successfully captured the event in slo-mo. If you want to add another slo-mo event in the same clip, then do not tap the stop button and keep on passing the event through the yellow box till you get what you expected. Now is the time for editing the video, once you tap on the stop button, you will see a screen showing the video with different options. Tap on the slow-mo icon on the video, and you will see a toggle to turn on and off on the whole timeline of the video. Finally, export the video to the gallery and share it with your friends on social media. You can also set the super slo-mo videos as the lock screen wallpaper which looks super cool on the smartphone. 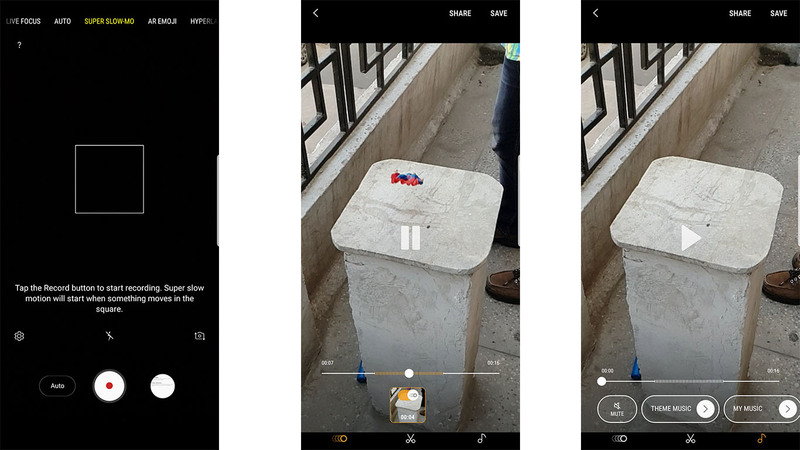 The super slo-mo videos on the Samsung Galaxy S9 can also be captured in manual mode where there will be no yellow box. But we recommend the auto mode because manual mode needs a lot of effort to capture a slo-mo video on the smartphone.